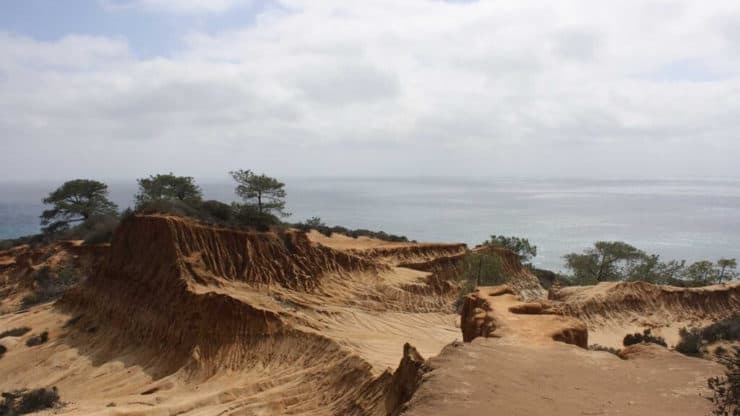 This Torrey Pines hike takes you to the best of the park – you experience get great ocean views, hike through unique geological formations, get a glimpse of the world-famous golf course, hike on an antique version of the Pacific Coast Highway, and of course, get see the Torrey Pine. 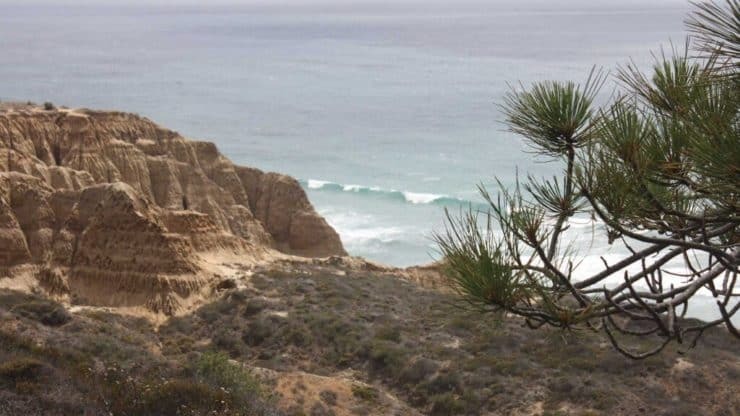 The Torrey Pine is the rarest pine tree in the United States and is an endangered species. You can only see them here and on the Channel Islands. 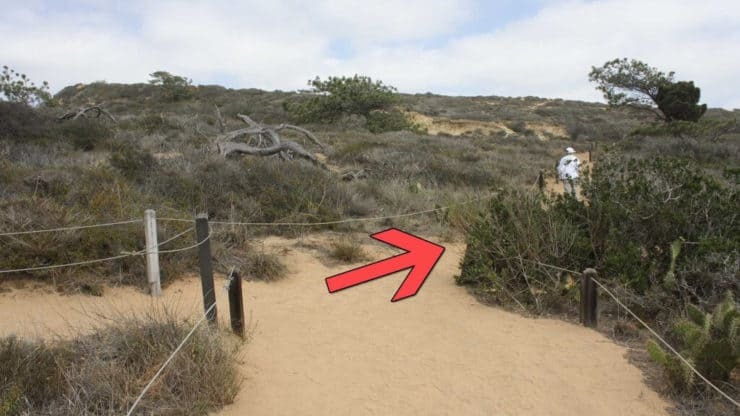 As you’re hiking Torrey Pines, remember that the environment is fragile, so please stay on the trail. 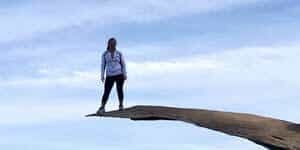 Torrey Pines State Natural Reserve is one of those once in a lifetime destinations, I highly recommend this hike! 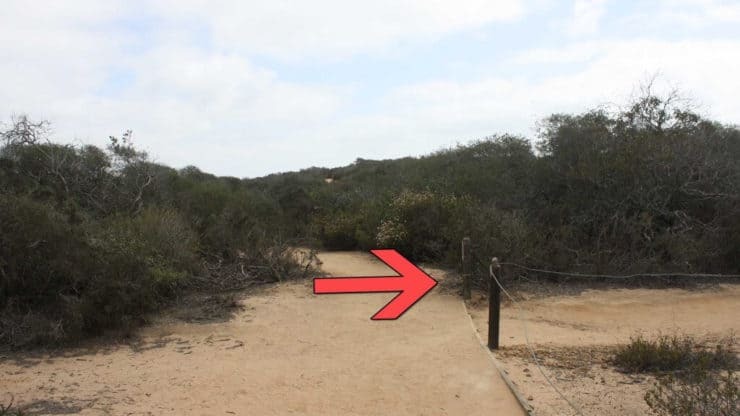 Torrey Pines State Natural Reserve is very popular, get here early to beat the crowds. If it’s after 8am, you might have a hard time finding a parking space. 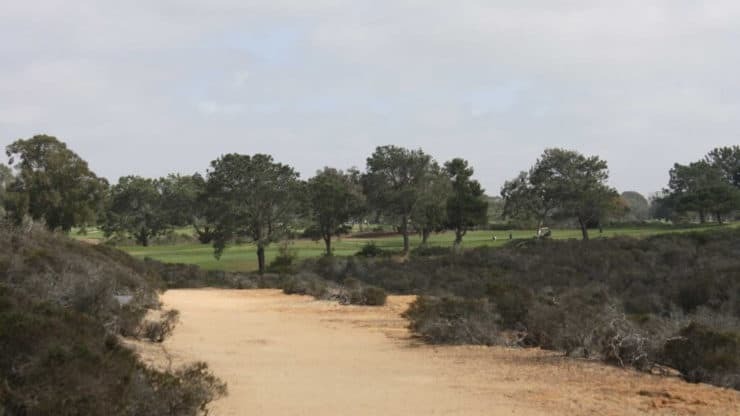 Use this address to get to Torrey Pines: 12600 N Torrey Pines Rd, La Jolla, CA, 92037, USA. 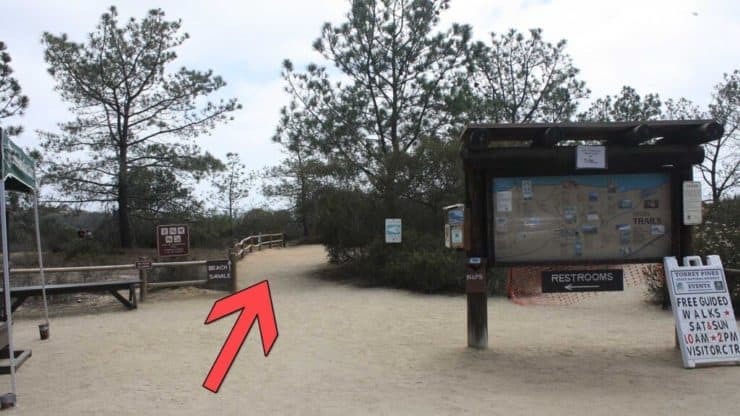 To park, drive up past the entrance gate, go up the hill, and enter the first parking area on your right, just past the visitors center on the left. 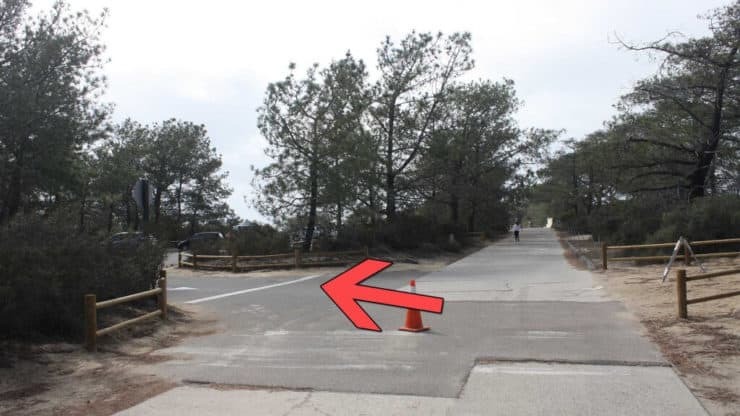 After entering the park gate, drive up the narrow road to the visitors center. The parking area for the hike is up the hill on the right. 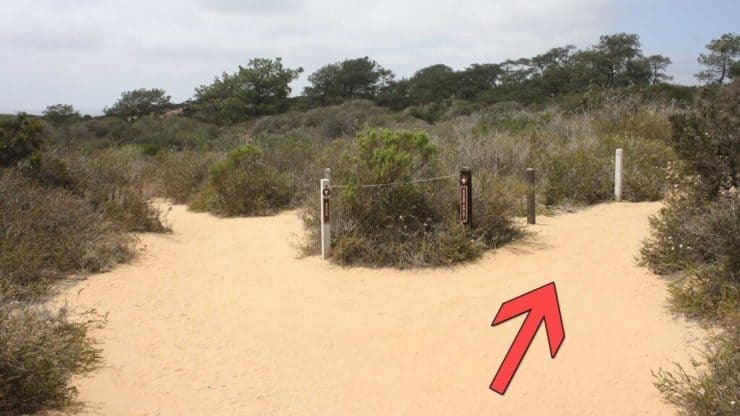 The Torrey Pines State Natural Preserve Visitor’s Center, in the parking lot across from the hike lot, is worth a look. 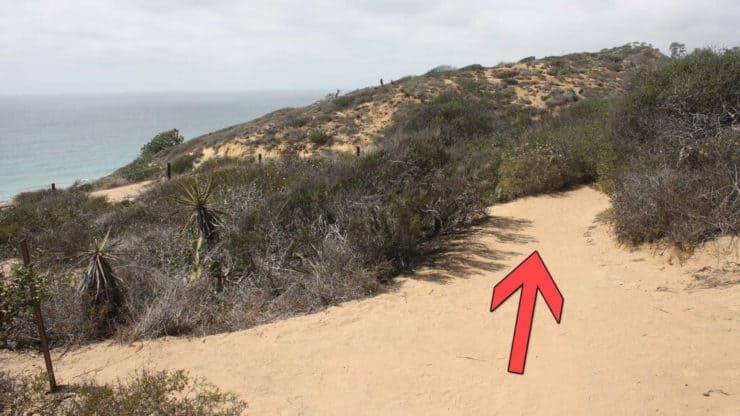 You don’t need any special hiking gear for Torrey Pines, you can get away with workout clothes. 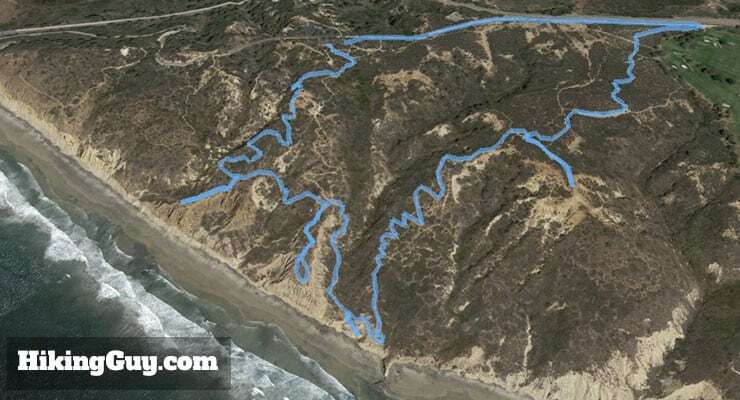 If you’re thinking of swimming, the hike does go down to the beach at one point. If you’re not from the area, you might not know that the Pacific Ocean is usually pretty cold. You can take a dip if you hike in a bathing suit, but it’ll be chilly. 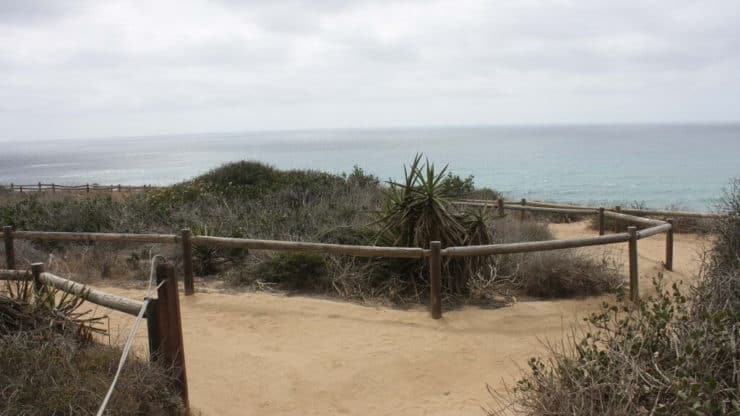 The hike hits all of the overlooks in Torrey Pines Park, then heads down to the beach. 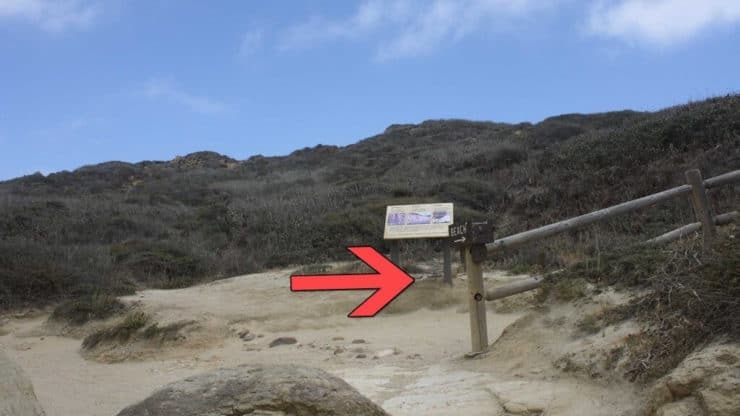 From the beach, it climbs back up and to the trailhead. 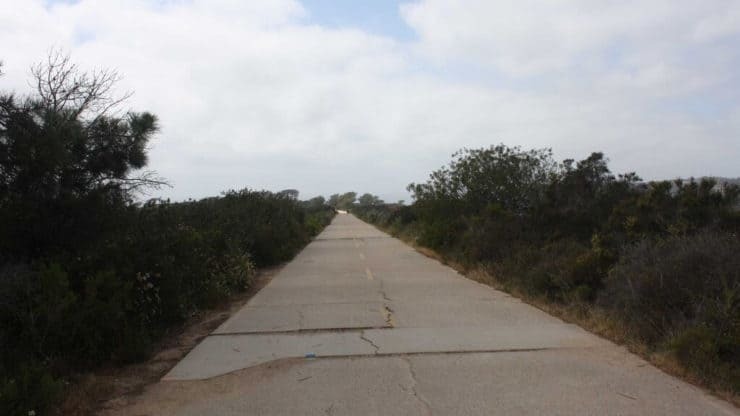 The hike meanders down to the ocean, then climbs back up to Torrey Pines Park Rd. 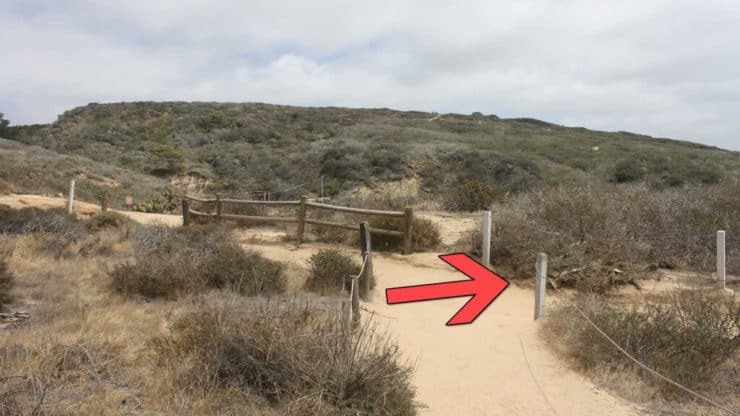 Before starting the Torrey Pines hike, check out the hike board for any closures or park information. 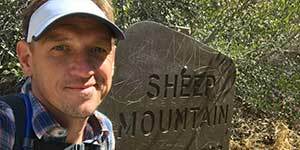 At about 0.1 miles, the trail forks, hike to the right. 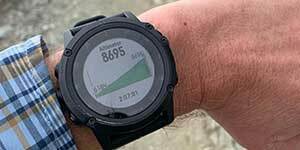 At about 0.2 miles, the trail splits. 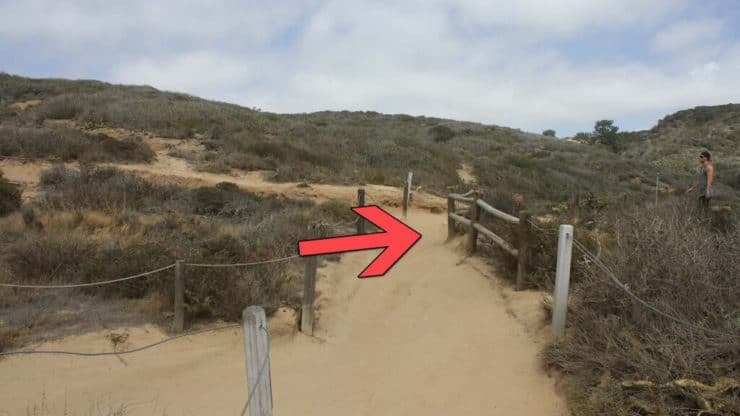 Hike to right to check out the nice ocean and park view. 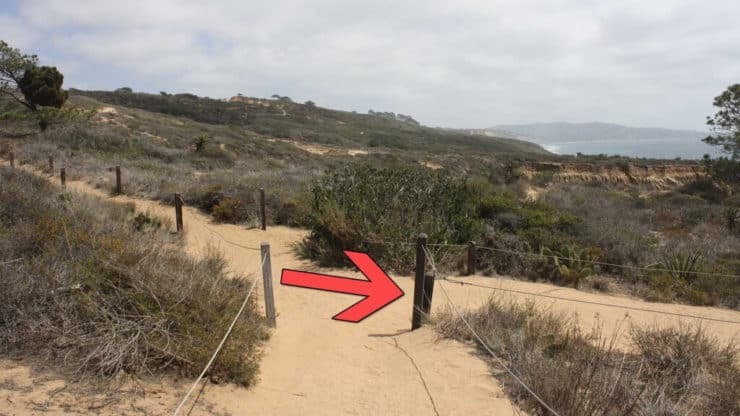 There’s a fence at the overlook and you’ll see a trail below, don’t hike down there. Turn back and hike to the last fork. 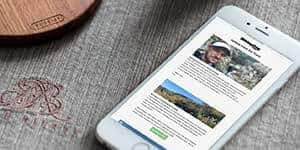 Check out Red Butte, and then hike down the other side as the trail continues. 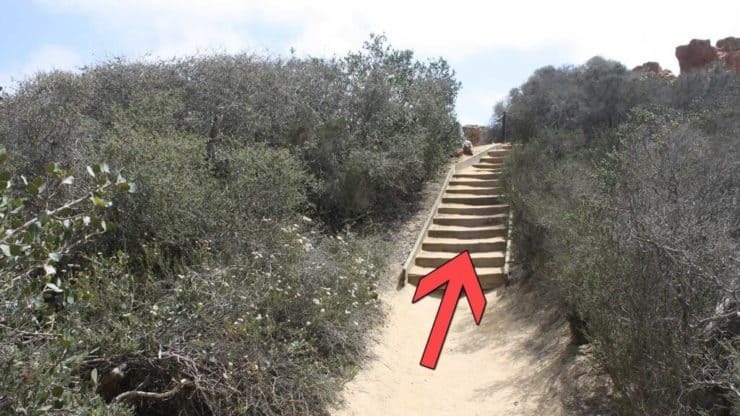 At about 0.3 miles, hike to the right. here’s a switchback, keep hiking straight (the left trail cuts off the switchback and ends up in the same place). 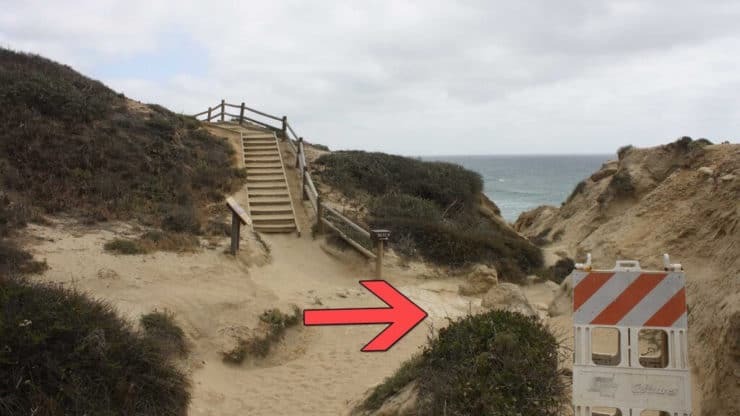 At 0.5 miles, hike to the right and walk down to Razor Point Overlook. 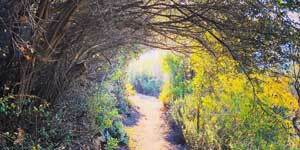 Soak in the ocean views at Razor Point, then hike back the way you came. Hike to the right back at the trail junction. The ocean views are great as you continue. 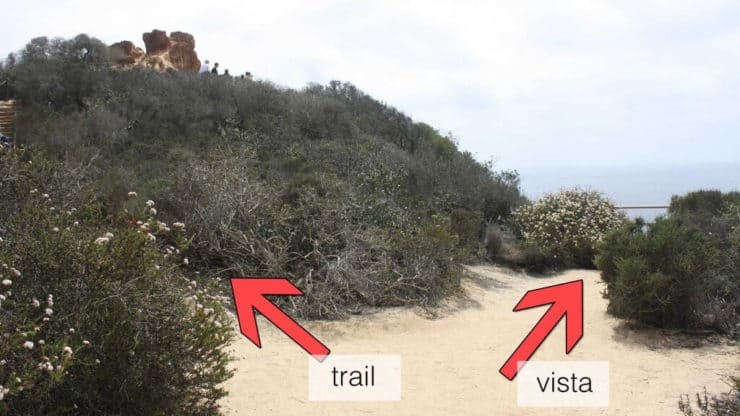 At 0.9 miles, hike to the right on the trail to Yucca Point Overview. 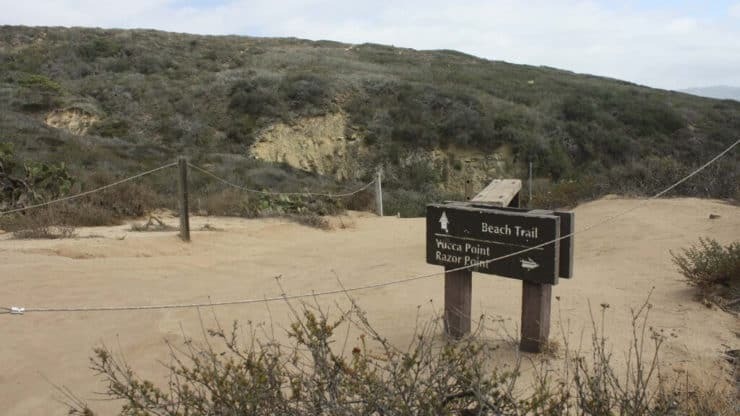 Yucca Point Overlook has some nice ocean views, take it in, turn around and hike back. 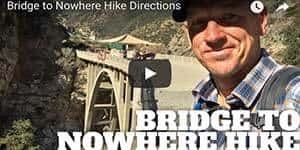 Back at the intersection, hike to the right. 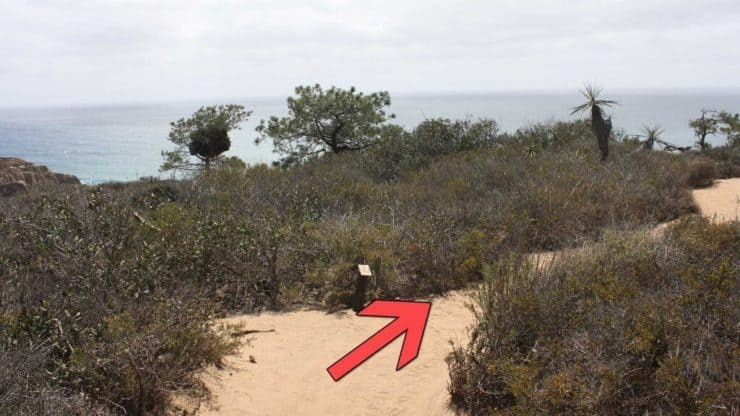 You’ll see a sign for the Beach Trail, hike straight on the Beach Trail. 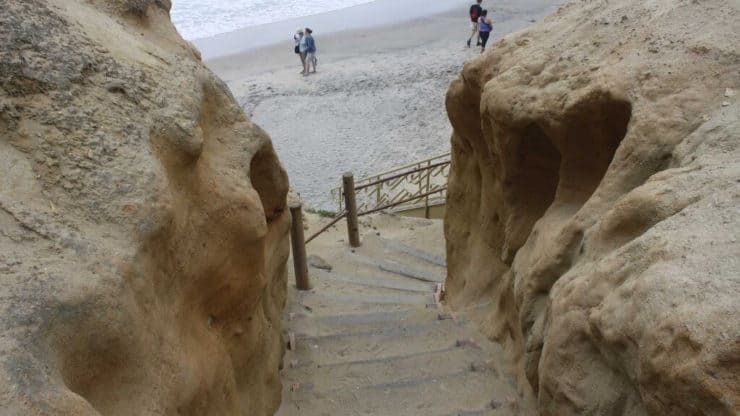 At about 1.3 miles, head right and hike down through the little slot canyon to the beach. 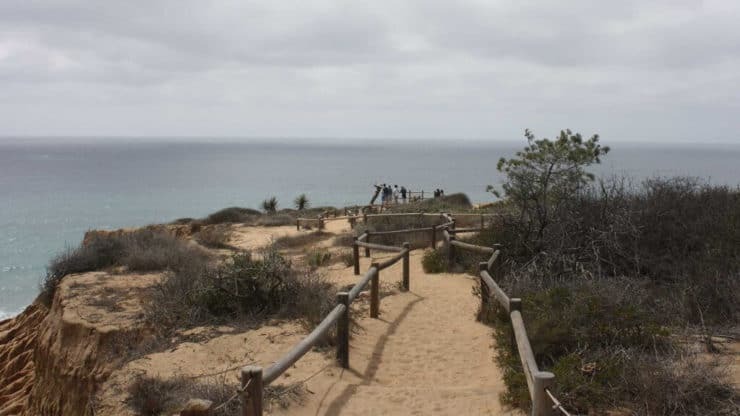 The trail to the beach heads through the sandstone cliffs. 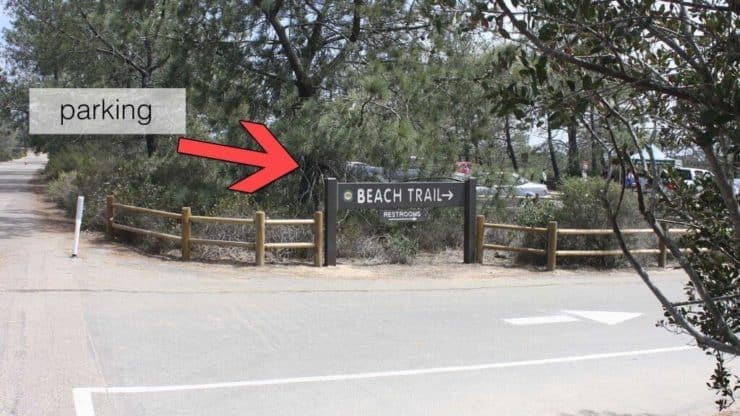 Explore the beach and then head back to the last trail junction. Back the trail junction, hike to the right up the stairs. You’ll climb up for a while on the trail. 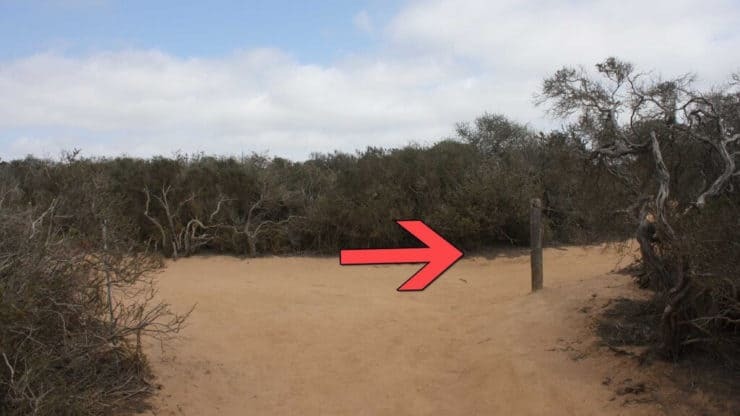 At about 2 miles, hike to the right at the fork. After that it’s a quick right to Broken Hill Overlook trail. 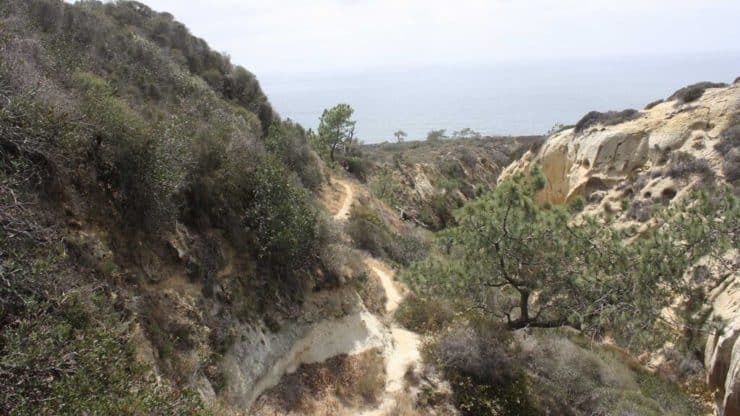 Hike straight down the trail to Broken Hill Overlook. This overlook has the least crowds and might be the most spectacular. We saved the best for last. Hike back to the junction and make the right. 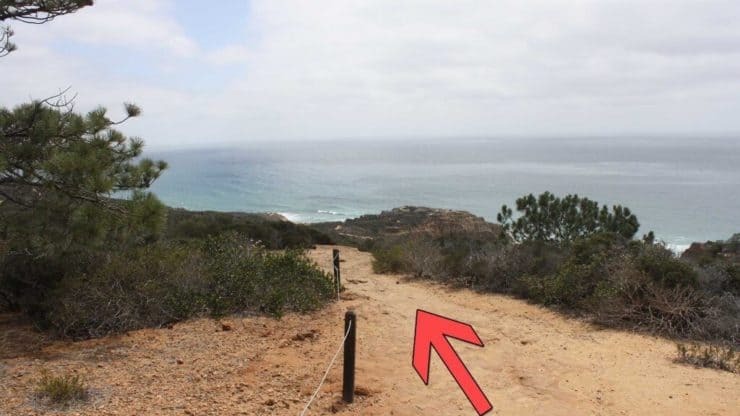 As the trail climbs up, you’ll see the famous Torrey Pines Golf Course off to the right. 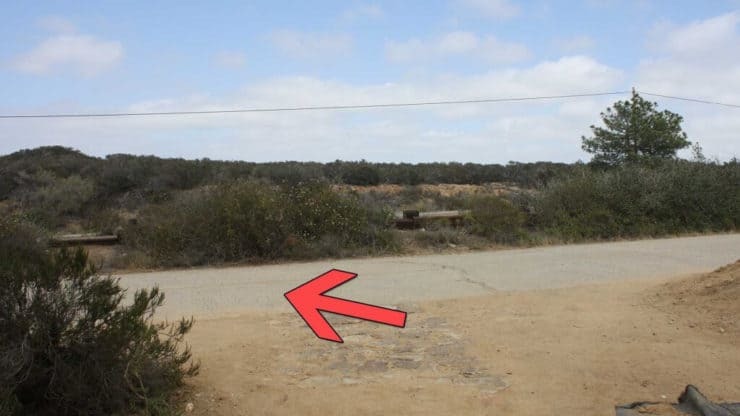 At about 2.7 miles, you’ll reach the old San Diego to Los Angeles road. Hike to the left to walk back to the parking lot. The old road goes along the ridge int he park. To your right will be nice views of northern San Diego. There are interesting information placards along the way. 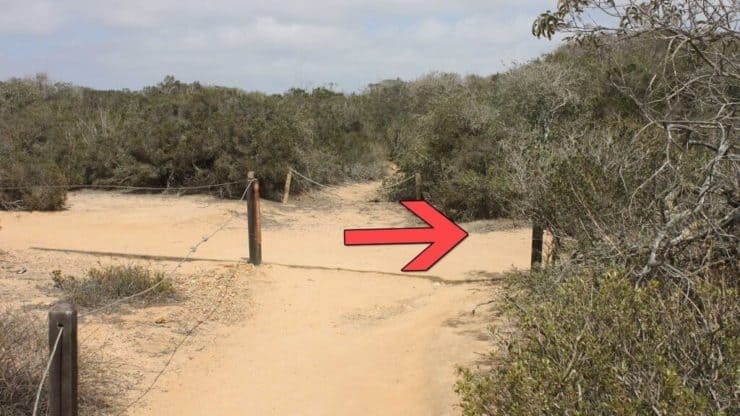 Eventually you’ll reach the end of the hike at parking lot where you started on the left.